Performed by Challenge: Anthony Braxton, alto saxophone, Chris Brown, piano/celeste, Amy Radunskaya, cello, William Winant and Scott Evans, percussion, David Rosenboom, conductor, and Tom Erbe, sound rotator. Recorded at Mills College Concert Hall by Erbe, post production at Mills College Center for Contemporary Music and computer processing by Rosenboom at Center for Experiments in Art, Information and Technology, The Herb Alpert School of Music, California Institute of the Arts. Pianist and interactive computer instruments. CDCM Series, Vol. 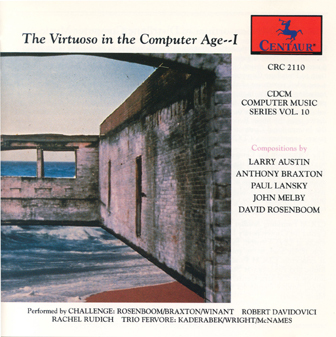 10, (CD), #CRC 2110: The Virtuoso in the Computer Age, Centaur Records, Inc., Baton Rouge, LA, and Consortium to Distribute Computer Music, Dallas, TX, 1991.